The only surface link that connects the valley from the rest of the country has been blocked because of heavy snowfall. As snow continues to cut off the Kashmir valley from the rest of the India, thousands of stranded Kashmiris are waiting in Jammu to be airlifted back home. However, chaos ensued when clashes erupted between few college students from Gandhi Memorial Science College and the stranded passengers on February 11. On Monday, the stranded passengers had gathered near Mufti Hostel, near Science College to register themselves when they started protesting against the alleged failure of the administration to help them “in the hour of crisis”. Following the protest, a few students started through stones at the protesting Kashmiri passengers. A local requesting anonymity told Kashmirwalla that the students thrashed them saying, “You are a Pakistani, go to Pakistan. Yahan Modi Raj Chalega (Only Modi raj will work here),” and later hurled stones at them. As per the local reports, the students of Gandhi Memorial Science College, gathered outside the campus and raised “objectionable slogans.” The Kashmirwalla reported that the students chanted, “Desh ke gaddaro ko, goli maaro saalon ko (Shoot the traitors)” and “Vande Mataram”. 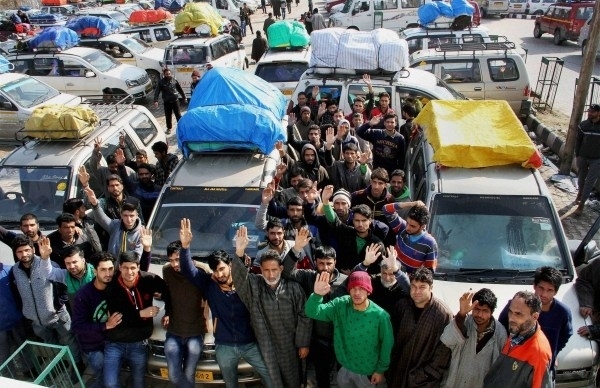 The incident has created panic among the stranded Kashmiris. However, the police reached the spot and got the situation under control. The only surface link that connects the valley from the rest of the country has been blocked because of heavy snowfall. Even the trucks to carry goods to the region remain stranded. The stranded passengers also include students who had come to Jammu to appear for GATE exams.